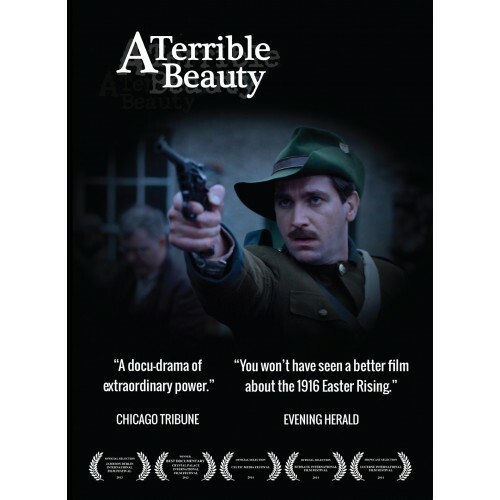 is a feature length docudrama on DVD that offers a fresh approach to the story of the 1916 Easter Rising. This is the first film to tell the story from three different perspectives, showing the human cost of the fighting on all sides. Using the postwar writings of men and women who were there to drive the narrative, it tells the little-known stories of the ordinary people involved in the Rising; Irish Volunteers, British soldiers and the innocent civilians caught in the middle. It focuses on the two most ferocious battles that took place during Easter week, the battles of Mount Street Bridge and North King Street, culminating in the massacre of fifteen young men and boys. By mixing dramatic battle reconstructions with archive footage and first-hand accounts, it takes the viewer on a journey to the very heart of the conflict, giving them an up close and personal view of the often brutal and bloody fight which affected the men and women caught up in the chaos. Over the next few years History Ireland intends to produce a series of authoritative annual publicat..
W.B. Yeats famously remarked that Ireland after the Easter Rising was ‘changed utterly’. Few would d..
Pre-publication to 1.10.2017The Easter Rising was the catalys..
Tommy Graham, Brian Hanley and Fearghal McGarry (editors)..